Warning!! 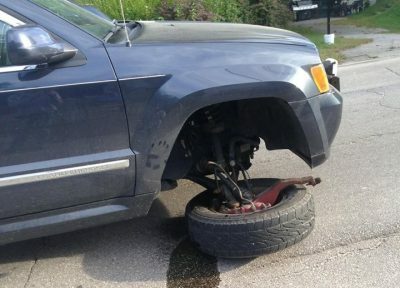 Do you have the factory Chrysler upper control arms on your Jeep Grand Cherokee? 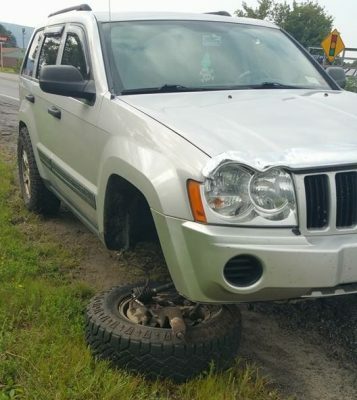 If your Jeep is lifted and has over size tires, You may be at risk of losing a front tire!! In less than 2 weeks I got these disturbing picture emailed to me or sent to me on Facebook!! In both failures the ball joint separated from the factory Chrysler upper a-arm. Please check your ball joints!! Or up grade your factory Chrysler a-arms to my JBA upper a-arms for the lifted WK/XK!! may cause you problems down the line. If they fail completely, you can end up with a situation like this. Therefore, if you can afford it, you really should upgrade your UCAs when lifting.